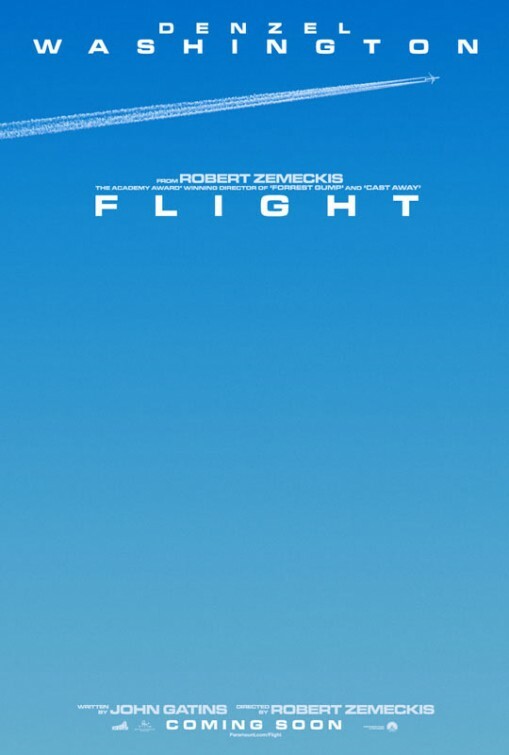 After spending years immersed in motion-capture filmmaking (“The Polar Express” and “Disney’s A Christmas Carol”) veteran director Robert Zemeckis has returned to live-action with “Flight”. While he’s produced many movies since releasing “Cast Away” and “What Lies Beneath” twelve years ago, all eyes are on Zemeckis the Director, to see if the Oscar-winner’s magic is still intact away from the animation genre. The response to his latest film will likely be one of overwhelming praise, what with its breathtaking beginning and the enduring appeal of its star. I’ll give it that, but “Flight” also nose dives into predictable characters in situations we’ve seen before. Even with some stunning visuals and a mostly compelling examination of self-destruction, there’s no getting around a certain air of familiarity about it all. Zemeckis earns his R-rating (his first since “Used Cars”) immediately with an opening that shows a disoriented man peeling himself off a hotel bed, while a completely naked woman collects herself. This is Whip Whitaker (Denzel Washington), a man who treats his hangover by polishing off whatever beer is left in any nearby bottle and a quick snort of coke. After an annoying phone call from his ex-wife, requesting child support money, he says goodbye to his attractive companion (Nadine Velazquez, from FX’s “The League”) and strolls into the hallway in his airline pilot uniform to the tune of Joe Cocker’s “Feelin’ Alright”. It’s the first of many blaring (literally) musical sequences that employs either Cocker, The Rolling Stones, The Beatles or some other classic rock staple to accompany a specific attitude or persona on-screen. It happens often in films (mastered repeatedly by Scorsese), but Zemeckis is hitting us over the head here with his own jukebox. Here’s why – he feels the need to play “Under the Bridge” by the Red Hot Chili Peppers during a heroin scene and Marvin Gaye’s “What’s Goin’ On?” when Whip is trying to figure out exactly that. I was expecting to hear “Taking Care of Business” while Denzel sits on the toilet, recovering from his many overdramatized binges. Anyway, a fully-loaded Whip makes his way to work, a job where he can’t just snooze his way back to functioning capacity in a cubicle (just don’t tell him that). He has to pilot a commercial airplane from Orlando to Atlanta, on a rainy morning with challenging visibility and a nervous young co-pilot (Brian Geraghty, “The Hurt Locker”). Thing is, this is no problem for Whip. He can do this. He’s a functioning alcoholic and a drug user, after all. Based on the reaction of Maggie (Tamara Tunie), a nurturing flight attendant who (we gather) has worked with Whip for years, we get the idea that this is normalcy for Whip. Just give him a cup of black coffee and some Tylenol and he’s good to go. Nevertheless, it is still very unsettling to see an inebriated individual with so much responsibility exude such a calm and cool demeanor, but that’s what we’ve come to expect from Washington. It’s not just that Whip, clearly a talented pilot who can push his passenger-filled plane to insane speeds out of a storm, can effortlessly handle his duties, it’s also a Washington can ace. He’s previously played reprehensible characters (“Training Day” and “American Gangster”), those who inspire (“The Great Debaters”) and action anti-heroes (“Man on Fire”) with such dependable “movie star” charisma and charm, the kind that make audiences eager to follow his every move. So, to see Washington play Whip as an arrogant, stubborn man who refuses to acknowledge his inner demons without an ounce of humility, isn’t much of a stretch. Now, that doesn’t mean Washington isn’t good at it, he’s great here. Which is what we expect from him. 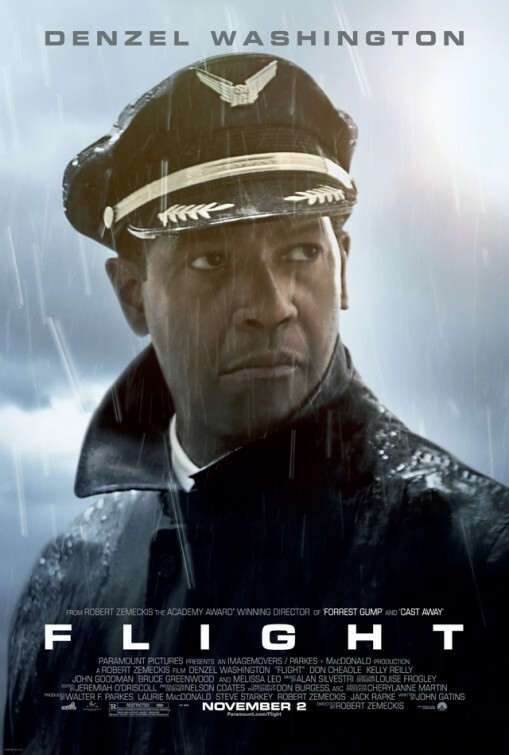 But once he takes us down a destructive spiral that follows his miraculous emergency landing that kills only six of the 104 onboard, the recognizable Denzel-isms coast their way through the rest of the film, taking too long of a time to reach a vulnerable and emotionally raw ending. Regardless, fans of Washington are getting what they want. I guess I wanted a little more subtlety, something more nuanced from the actor for such a complex character. 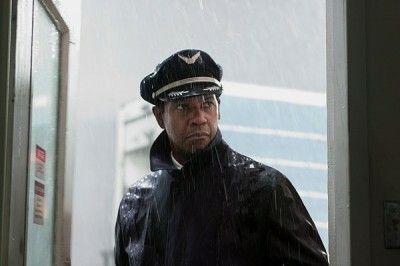 Nevertheless, the white-knuckle crash-landing will get people to the theaters to watch “Flight”. Sure, there’s the curiosity regarding Zemeckis return to live-action, but most viewers will have seen the commercials and the trailers, showing that powerful image of an airplane flying upside down and that’ll do it for them. It did for me, when I first saw the trailer. Clearly, that’s Paramount’s plan, with the studio promoting the film as an action thriller or categorizing it as a mystery/suspense film. It’s not. Viewers may not be prepared to follow “Flight” for what it tries to be, which is a compelling and (at times, disturbing) drama. That’s actually what I wanted to enjoy about the film. There is compelling drama to be found in watching Whip continuously pinball between recoveries and episodic binges, while noticing how he affects those who desire to help him. At no point in John Gatins’ (writer of last year’s “Real Steel”) screenplay though is Whip sincerely seeking help, which becomes quite frustrating and tedious. During the long middle (it feels longer than its actual running time – never a good sign) of “Flight”, we see the kind of conventions found in many other films dealing with substance abuse. It’s like a rinse and repeat of bad behavior emphasized with lazy filmmaking. Whip gets drunk, then gets caught and goes into denial, telling everyone to go to hell. Whip gets wasted and is told by the painfully stereotypical Christians he encounters that there’s something greater in store for him. Ugh. His last big blow-out is so cheaply executed (in another hotel room too! ), that I was literally looking for the eject lever on my seat. Most of the characters played by the usually fine supporting cast are also written into a certain limiting comfort zone. 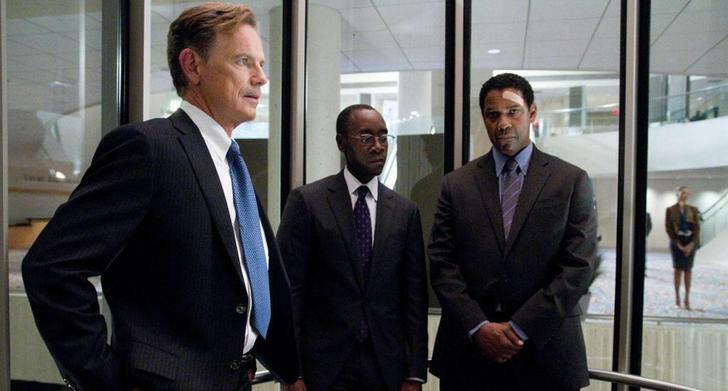 Bruce Greenwood plays Charlie Anderson, a buddy who used to fly with Whip in the Navy, who’s now a union rep trying to defend Whip in the post-crash investigation. When the spotlight is focused on the pilot’s shocking toxicology report, the spinning begins. Don Cheadle stars as Hugh, the methodical lawyer from Chicago, called in to sweep everything under the tarmac in order to save Whip’s career and the airline’s reputation. Neither of these gentleman have an easy job, since Whip’s cyclical behavior thwarts their efforts at every turn. Trying to help someone who just wants to slip by under the radar over and over will only takes you down as well. Unfortunately, like Washington, both of these actors get in there and do what we’ve come to expect of them, relegated to playing characters we’ve seen them play in the past. Melissa Leo (“The Fighter”) shows up too, as a lead investigator determined to emphasize the condition Whip was in during the flight. She’s set on pinning the deaths on him (hammering the “Someone must pay!” a bit hard), not praising him as a hero as the media immediately does. It’s barely a role for Leo, who’s almost unrecognizable because she’s cleaned up and from the recent unflattering roles she’s played. Probably the most obvious example of typecast acting though is John Goodman playing Harling, He’s Whip’s speed-dial Dr. Feelgood. He supplies the addict with the goods he needs to function, whether that’s leveling him off or lifting him up. Zemeckis cranks up the volume whenever Goodman shows up, seemingly because it’s a loud darkly comic role, albeit one-dimensional. 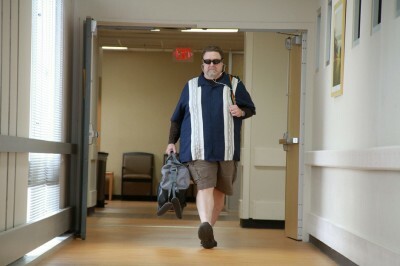 But also because the director feels the need to remind us that John Goodman (an actor who’s everywhere this year) playing a smooth drug whisperer requires a rockin’ soundtrack. Dude. There are a couple characters who come into Whip’s post-crash life that feel a little more genuine and slightly less stereotypical in their characterization. Then again it could be because their faces aren’t as automatically recognizable as the others mentioned. Whip meets them in a hospital stairwell where all three sneak a smoke. Nicole (Kelly Reilly, “Sherlock Holmes: A Game of Shadows”) is a junkie who almost overdosed (Zemeckis cut to that scene during the crash) and a pontificating cancer patient (a brief James Badge Dale, “The Grey”) who oddly must repeat how beautiful Nicole is. In one of the few understated choices made by Washington, the actor mostly just stands against the wall, watching these two and listening. If only I could’ve caught a connecting flight to that film. I don’t regret watching “Flight”, I just don’t like where it took me after such a harrowing event. Everything felt predictable after that. I found myself unsurprised and literally mapping out where each character would go as they went there. For a movie that focuses on challenging subject matter, it is incomprehensibly restrained, offering a Cliff Notes version of addiction instead of sending us to the dark territory it deserves. See “Clean and Sober” or “Shame” to understand what I’m getting at.